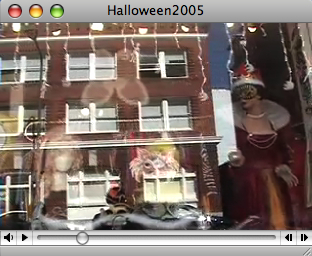 Inspired by Zadi’s HalloweenVlogfest2005, I try to capture the most about Halloween in the shortest time! I am having problems getting .mov to compress better than .m4v. I end up with lower visual quality and a larger file. If anyone has recommendations, I am all ears. Update: I got some great tips from Freevlog and highly recommend the site if you are learning how to do this (like me). updated: fixed broken link! Oct 10, 2006. I like it – it’s fun and not macabre!